1. Application must be filled in the prescribed format (Attached along with advertisement) and reach us on or before 26th February 2018, 05:00 PM. 2. Only scanned copy of application downloaded from AIIMS Raipur website and duly filled will be accepted. Incomplete applications or applications without prescribed format or received after due date will not be considered. 3. Filled applications as scanned copies should be sent by email to cdcamrraipur@gmail.com. 4. Candidates kindly ensure their eligibility for the given post. 5. Only shortlisted candidates will be called for written test / interview. 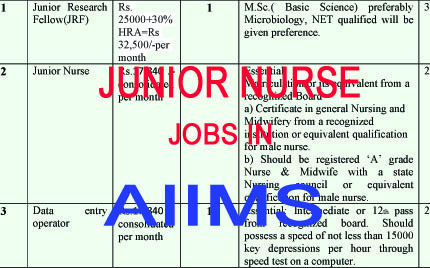 The list of the final short listed candidates will be floated on the AIIMS Raipur website by 3rd March 2018. 6. No TA/DA will be given for the same. 7. Hardcopy of application along with 2 photographs in envelope superscribed as Application for the post_________________ under CDC funded project entitled “Capacity Building and Strengthening of Hospital Infection Control to detect and prevent antimicrobial resistance in India” should be sent in address – Office of department of Microbiology, 1st floor, Medical College Block, Gate No. -5, AIIMS, Tatibandh, Raipur, CG, Pin-492099. 8. Original and self-attested photocopies of proof of date of birth (class 10th certificate), eligibility qualification mark-sheets, degrees, experience certificates has to be submitted by shortlisted candidates while appearing in Written Test/Interview. 9. Any candidate found ineligible at any stage would not be allowed to proceed further for written test/ interview. 10. No enquiries shall be entertained in this regard after due date.